It seems like it was only yesterday that Bank of England governor Mark Carney was predicting fire and brimstone metaphorically, and a recession literally, if Britain votes for Brexit. Well, Brexit happened, the recession didn't, and the Bank of England went so far as to hike rates in an attempt to cool off the economy which did everything but enter a recession. Fast forward to today, when Carney was at it again, and in another masterclass of central banker propaganda, delivered a "chilling" warning to embattled PM Theresa May, warning that a hard, or "no-deal" Brexit could lead to economic chaos as bad as the 2008 financial crash and would unleash a property crash that could see house prices fall by 35%. The property crash would be driven by rising unemployment, depressed economic growth, higher inflation and higher interest rates, the head of the central bank said. During a briefing of senior ministers on BOE’s modelling on the consequences of the EU agreeing to a skeleton deal, one in which a few ad hoc arrangements are struck and a worst case chaotic exit, Carney said that he would not be able to avert a crisis by cutting interest rates - when the bank also predicted a dire recession - and that inflation and unemployment would rise. 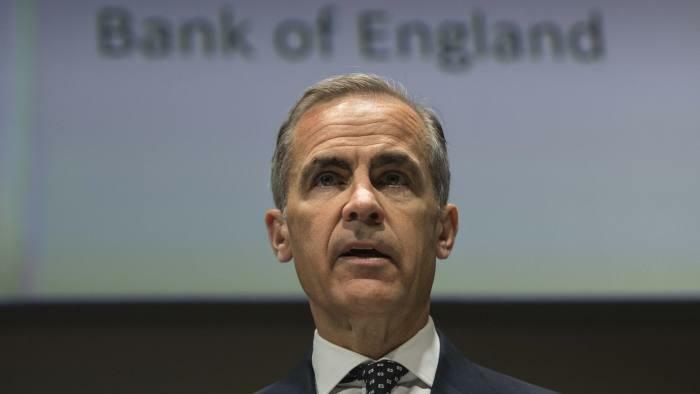 Carney said that unlike the BoE’s rate cut in 2016, this time the shock to Britain’s economy would come from disruption on the supply side, as trading relations between the UK and EU took a hit. Last week, the governor made similar warnings in public, telling MPs on the Treasury committee that in a disorderly no-deal Brexit, “the real income squeeze will return for households across the country for a few years”. But what about the UK's banks: wouldn't they also be devastated by a hard Brexit, potentially leading to a preemptive bank run? Why, no. Because somehow despite modeling the apocalypse, Carney said the bank's "stress tests" of the UK’s financial system showed that it could withstand the worst case scenario. The all too clear political propaganda continued when Carney boosted May’s position, saying that if she struck the Brexit deal based on her much-criticized Chequers exit plan presented to Brussels in July - which has led to several near revolts within Brexiteer conservatives - the economy would outperform current forecasts, because it would be better than the bank’s assumed outcome. In other words, anything but a hard Brexit. One can see why Jacob Rees-Mogg, leader of the Eurosceptic European Research Group, last month called Carney, who earlier this week agreed to stay in post through Brexit until January 2020, "the high priest of Project Fear." According to the FT, Theresa May had intended the three-and-a-half hour cabinet meeting to review no-deal contingency plans and to send a signal to the EU that Britain was prepared for the prospect of Brexit talks failing. Instead, Carney - a former Goldman employee and a consummate globalist - and Philip Hammond, chancellor, "joined forces to deliver a blow-by-blow account of why such a scenario would be economically damaging and that there would be little the BoE or Treasury could do about it." Hammond said the Treasury would be constrained in its ability to tackle the crisis by boosting spending, noting the country was "still recovering from the aftermath of the 2008 crash" and questioning the effectiveness of a fiscal stimulus in one country. Maybe they were not hostile then, but they will be soon: Tory Eurosceptic MPs will soon ridicule the BOE head's warnings, claiming - correctly - that both the BoE and Treasury both miscalculated the economic consequences of Brexit, which they also painted as a singularly dire event. Jacob Rees-Mogg, leader of the Eurosceptic European Research Group, last month called Carney, who this week agreed to stay in post through Brexit until January 2020, “the high priest of Project Fear”. So did the "fear priest's" threats lead to any change in sentiment? Not at all, as both sides remained entrenched in their views. The only agreement at the cabinet meeting was that a no deal outcome was "unlikely but possible." A spokesman told the FT said that Whitehall departments had “significantly ramped up” their no-deal planning in recent weeks. Which simply means that Carney will need to ramp up the apocalyptic forecast even more during his next public appearance.